The film Jason X is not as universally hated as it's predecessor Jason Goes To Hell, but it is still looked upon with much scorn my a number of loyal Friday The 13th fans. Even if you did not like Jason in Space, there is no denying the film has a fun factor to it that can keep you interested in watching for more than anything else to see Jason dispatch of a large number of victims in interesting and new ways. Jason Voorhees' look in the film changed drastically (and we're not talking about the Uber-Jason transformation), once again, from the previous films and most notable was the design of the hockey mask itself. Jason's costume is Jason X is another unique design within the franchise for which Mario Kirner owns a good amount of the multiple pieces created by the production crew. 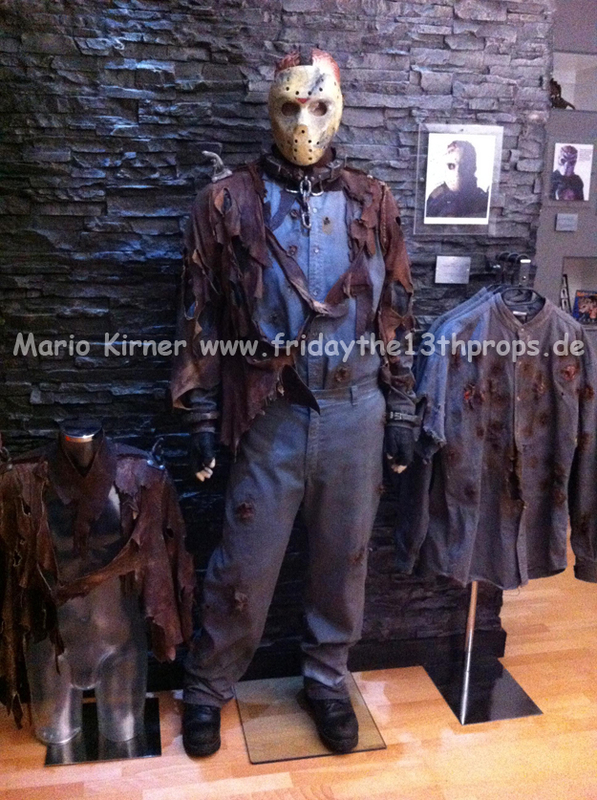 Mario was nice enough to share a photo and some information about the costume that is part of his Friday The 13th Props Museum. Please read on for what was created for the Jason costume before he became Uber-Jason. Thanks to Mario for sharing this great photo and information with our website! Mario's collection consists of 4 complete sets of shirts and pants and the two hero straight jackets. 10 straight jackets were made for production. And 40 sets of pants and shirts with various amount of bullet hits and battle damage.